On April 29, 1999 a shot was fired from a .22 bore pistol whose loud reverberations lasted over a decade. The shot that killed a vivacious, aspiring model Jessica Lall was fired in the presence of more than 100 'socialites' present at a party in New Delhi. Yet, accused Manu Sharma walked free in 2006 prompting a newspaper headline that read "No One Killed Jessica". In the ensuing decade, Venod Sharma, father of the accused and a high profile congress leader, paid millions of rupees to silence witnesses. It was not until the Tehelka Magazine did a sting investigation and Star News aired the footage that justice was finally served. "No One Killed Jessica" faithfully follows the case to emerge a winner. Almost everyone knows the story. Yet, the film makes some interesting departures to keep the momentum going. A Barkha Dutt type character has been introduced in Rani Mukerji though the former did not have much to do with the case or its reinstatement. However, Rani lacks the intensity to pull off such a strong role and the strain shows. 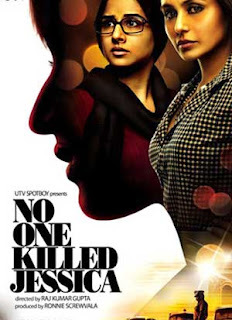 On the other hand, Vidya Balan soars with the unglamorous, distraught and hunchbacked portrayal of Jessica's sister. Director Raj Kumar Gupta makes direct comment on the society we live in, its voyeuristic tendencies and the judiciary's disregard for justice. Everyone knows the extent of corruption and rot in the system as symptomised by the acquittal of Manu Sharma, but the question as always is who would bell the cat if the police and judiciary do not. In this case Tehelka, who did the sting investigation and Star News (and not NDTV that walks away with the praises in the film) that aired the footages did manage to right a wrong. But the question is not just of Jessica Lall, but the thousands like her whose cases have not had the light of justice shine upon them. The Jessica Lall murder thus became an emblem of the rot in the democracy, police and judiciary. The truth is, the culprits were not just Manu Sharma, his friends and his family, but Shayan Munshi who redacted his statements leading to Manu's acquittal and Bina Ramani, both of whom continue to have successful careers, one as an actor-model and the latter as a heedless socialite. The culprit is all of us who stay silent to the injustice all around us. The injustice done in Jessica's case has been corrected, but the question remains of the millions of other cases of injustice in the country. Gupta's film on a true incident bodes well for Bollywood, which is normally not too keen on reality, and the concept of justice itself. Yet, the question is not who killed Jessica Lall, but as the gross miscarriage of injustice in Kashmir, central and northeast India and the thousands of pending cases in the country show -- it is: who killed justice in India?